The Evernote for Android note taking app has been updated to version 6.0 and adds several new features and design elements to make it more functional. Evernote is a cross platform cloud-based app that allows users to add, create, view, and edit notes, pictures, documents, and even sounds across different devices. Among the improvements, you will get an updated Search bar and a New Note menu, which makes things more functional. You can access the New Note button by hovering in the lower-right corner of the screen. Touching it will pop out, in a shiny new way, a choice of the 6 different note templates that current users are familiar with. The Search has been given advanced filters to help scan your plethora of notes easier. This is clearly a design element adopted from the Material Design language set to debut on Android L later this year. Another new feature is the ability to save a webpage to Evernote. To do so, you need to have the page opened in your browser of choice. When you want to save a certain page, tap “share” and choose Evernote. The app's mascot – a green elephant – will show its head on the bottom on the screen, much akin to a Facebook chat bubble. 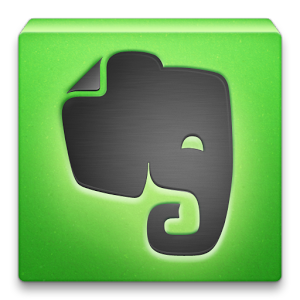 At this point – tap the elephant icon and you will get to choose which Evernote notebook you want to save the webpage to. Another tap sends it in.